In the wake of his wife's brutal murder, Opie returns to Oswald Lumber in the hope of leaving the club -- and criminal activity -- behind. Unfortunately, nothing in Charming stays clean for long, and corruption at the mill threatens to push him over the edge entirely. Meanwhile, as Jax and Clay wrestle for control of the club, one of Chibs's old IRA foes returns for revenge...and the Sons will have to decide how deep loyalty really runs. 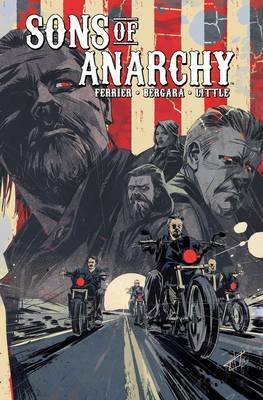 Written by fan-favorite Ryan Ferrier (Curb Stomp, Secret Wars: Battleworld) and illustrated by the incredible Matias Bergara (American Vampire, Sleepy Hollow: Origins), Sons of Anarchy Volume 6 links seasons 1 and 2 of Kurt Sutter's critically acclaimed television series. Also featuring a cover gallery by Toni Infante (Sons of the Devil).